Sometimes, the signs that your vehicle exhibits when shocks and struts are starting to show wear aren’t obvious. In fact, they are often mistaken for different engine problems, but if several occur at once you can be sure that it’s time to bring your car in for a diagnostic. Delayed steering response – If it takes more effort to steer, this is an indicator that new struts or shocks may be needed. Stiffness and unexpected noises when steering are also clear indicators that a replacement is in your future. Break instability – A change in brake behavior is another indicator that your vehicle needs service. Don’t panic. This may not mean new brakes are necessary, as this symptom could be a direct result of worn shocks or struts. Uneven tire wear – In a well-serviced vehicle, wear will occur across all tires evenly, but if shocks or struts require replacement, cupped and uneven wear will occur. Fully inspect your tires to determine if there could be an issue. If any questions come to mind, reach out to the experts you trust at All American Four Wheel Drive & Auto Repair. Unusual vehicle bounce – Should your vehicle bounce excessively while turning or stopping, worn shocks and struts are probably to blame. If this condition is a recent occurrence, it’s time to bring it in to your auto repair shop for an evaluation. Fluid Leakage – Is fluid leaking from the shock or struts? This is a clear indicator that service is required and eventual replacement may be the result. Pay attention to the visual signs. Examine your vehicle for possible problems. Fluid leaks, dented mounts, or damaged shocks and struts are signs that trouble is brewing. Cupping; an unusual tire wearing, may also be an indicator that it’s time not only to replace the shocks and struts, but also the tires. Vehicle handling changes are another clue as to the condition of your vehicle. Shaky and bumpy rides, poor steering response, stiffness and instability when braking, and swaying are signs that it’s time for new shocks and struts. Bringing in your vehicle for a diagnostic will assure that all maintenance issues will be addressed and resolved in both a timely and cost-effective manner. Don’t forget to consider your vehicle’s mileage. 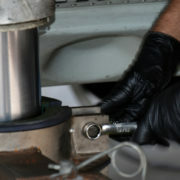 After 50,000 miles, most cars require new shocks and struts. Every 50,000 miles thereafter should spark a maintenance appointment. Trust All American Four Wheel Drive & Auto Repair to get you on the road safely, ensuring that of your engine’s parts are in good working order. Contact us today to schedule an appointment and don’t forget the importance of preventative maintenance.